The Confirmation Letter of the Unmistaken Reincarnation of the Late Great Mahasiddha Geshe Lama Konchog from His Holiness the 14th Dalai Lama. December 17th 2005. 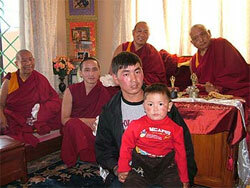 I have received a request for observation together with prayers and offerings from the faithful Lama named Thubten Zopa. He made this request on behalf of Kopan Ogmin Thubten Jangchub Choling Monastery and the Nunnery Khachoe Gyakiling and various Dharma centres. I have checked in several ways whether the boy named Tenzin Nyudrup is the unmistaken reincarnation of the late Lama Konchog. My observations in various signs as well as my divination also came out very auspicious. I feel very comfortable and confident identifying Tenzin Nyudrup as the unmistaken reincarnation of the late Lama Konchog. I advise Tenzin Nyudrub to recite as a daily practice the mantra of Manjushri and the Tsong Khapa Guru Yoga Prayer Migtsema Prayer.